New! Enjoy the powerful sound of the Westminster chime or beautiful melodies at the top of each hour. A four position switch on back will allow you to select: Westminster chime, Westminster chime every 15 minutes, or one of 16 popular melodies hourly, or one of three Christmas melodies each hour. Clock can be adjusted for auto night shut-off mode between 11 PM and 5:45 AM, or 24 hour play mode, or silent mode. 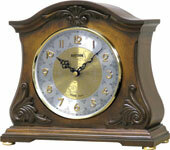 Its richness of sound and its heirloom quality construction will make this clock a focal point in any room. 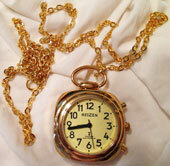 Mantle clock measures 9" tall x 10" wide x 5" deep and requires 2 C batteries included. 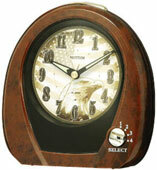 Place this attractive radio control clock in any room of your home or office. Clock features attractive simulated wooden case with large digital display. In addition to its attractiveness, this clock is extremely practical. The clock features include: a pleasant female voice, radio control function, large LED digital display, audible time, date and indoor/outdoor announcement, automatic vocal announcement of time and temperature from 8:00 AM to 10:00 PM, Wireless remote sensor, clock alarm and indoor and outdoor temperatures display. Clock measures 8 1/4" wide, 5" high x 2" deep and requires 2 AA batteries and wireless remote requires 2 AAA batteries (not included). WAA_WAA_WAAA!!! The clock that cries like a baby! Guaranteed to get you up in the Morning! The Cry Baby Alarm Clock is bound to drive you so crazy, you'll never over sleep.The baby figurine on top screams and cries "Mama get up!" Just tap the baby on the head to turn off the alarm.Other features include: quartz alarm clock with second hand and easy to set time and alarm on back of the clock. Clock measures 4" x 1 1/2" x 7"and requires 2 AA batteries (not included). Presenting a beautiful timepiece attractive enough to hang around your neck. This beautifully designed pendant features a delicate gold bezel with a yellow face with large enough numbers, so it can be easily read. Best of all, it automatically self adjusts itself for daylight savings time and leap year. This radio controlled pendant picks up the most powerful signal transmitted by the USA Atomic Clock in Fort Collins, Colorado. Just set your time zone and let the pendant do the rest. Other features include: audible time and alarm settings, hourly report and male voice announcements. Pendant comes with an attractive 28" chain. It measures 1 1/4" in diameter and requires 1 CR2032 battery included. This unique 10-digit calculator is packed with great features. All entries are reported in "units" or "digits". Most talking calculators will speak a result in separate digits, however this calculator will speak the whole number for example the number "2,4,3" will be announced as two hundred forty three. In addition, press the button to hear 16 melodies or set them as a wake up alarm for the talking alarm clock. Calculator will also announce the time in a female voice. Additional features include: volume control and 90 day warranty. Its compact size makes it easy to carry in a purse or suitcase for traveling. It measures 7" x 4 1/2" x 1 1/2" and requires 2 AA batteries (not included). Maybe not the same as waking up to the awesome aroma of bacon frying, but rapping, dancing bacon waking you up in the morning, is a close second. He dances, wraps, and sizzles to wake you up in the morning. Bacon alarm clock measures 8 1/2" high x 6 1/2" wide x 2" deep and requires 3 AA batteries (not included). Start your mornings in a patriotic spirit with our new American Morning Alarm Clock. Set the alarm clock to hear one of four patriotic melodies; America The Beautiful, Battle Hymn Of The Republic, My Country, 'Tis of Thee, and You're A Grand Old Flag. Simply select the melody with the switch on the front of the clock and set the alarm. Clock also includes volume control and on/off switch. 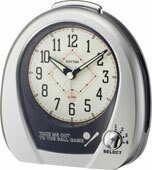 Alarm Clock measures 5.3" high x 5.1" long and requires 2 AA batteries included. 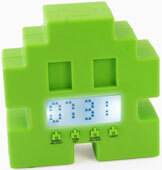 This 80s influenced Space Alien Alarm Clock is the retro way to start the day! Inspired by the famous arcade game character, when the alarm clock rings, it moves from side to side - just like on screen - and even makes a classic computer-game noise. Great gift for the gamer in your life! Clock requires 3 AA batteries included. 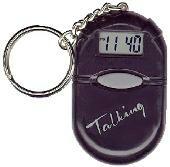 Your Minder Talking Alarm Clock allows you to record your own voice and use it as a personal alarm or reminder. Be creative and even record your favorite songs, bird or pet sounds, or fun messages in your own voice. Features include: record up to 6 personal messages, set up to 6 different daily alarms, speakers on both sides, time announcement at the touch of a button, large type lighted date/day/time display. Clock measures 5 wide by 1 3/4 deep and is 2 3/4" high. It is powered by 2 AA batteries or a DC adapter, both of which are included. Now you never have to reset your clock again! Our new talking atomic clock automatically self adjusts itself for daylight savings time and leap year. This radio controlled clock picks up the most powerful signal transmitted by the USA Atomic Clock in Fort Collins, Colorado. Just set your time zone and let the clock do the rest. Clock also features: talking calendar, audio alarm settings, volume control, hourly report, auto-night shut-off, large one inch LCD display and easy one button operation to hear time and calendar. Clock measures 4 1/2" wide x 5 1/2" tall x 2 1/2" deep and requires 2 AA batteries (not included). Now, even if you forget your watch you'll always know the time. Handy keychain fits easily in purse or pocket. Keychain displays and announces time in gentle female voice. Audible time and alarm settings plus audible hourly report. Measures 2" tall x 1" wide x 1/2" deep. Batteries included.